Sorry for my long absence from blogging. 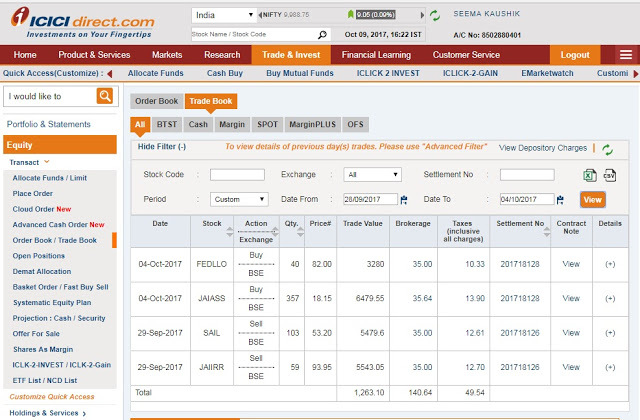 Actually, I promised to Prabhat Prakashan that I complete "Trading Tips" book on 20 Feb 2019 deadline, So I stopped all of my other works and focused my time on writing this book. Now this book is near about complete, and I will give it to the publisher ( It will take near 1 month to final publishing from the publisher). 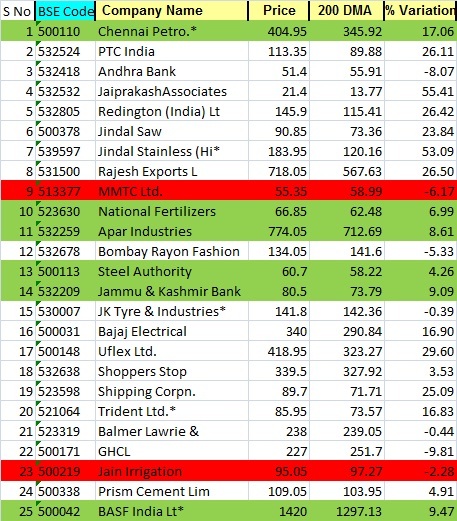 This Excel Sheet Contains all Indian listed companies EPS, P/E, NSPS, historical year high/ low data of NSE BSE stocks. This sheet also provides the ROE ratio of Indian companies in the Excel sheet and provides enterprises value of all Indian listed stocks. 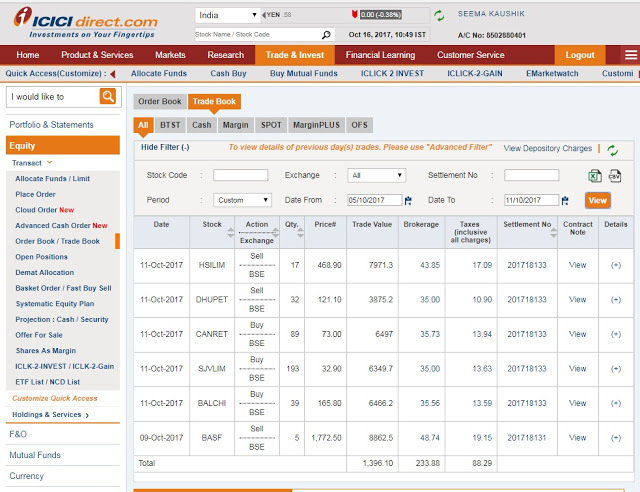 Tags:-data bank, India stock market data download, nse historical data, EPS, PE, ROE, ROCE, in excel sheet, download nse bse data in excel sheet. Today I Provide you my updated data bank of Nov 2018. 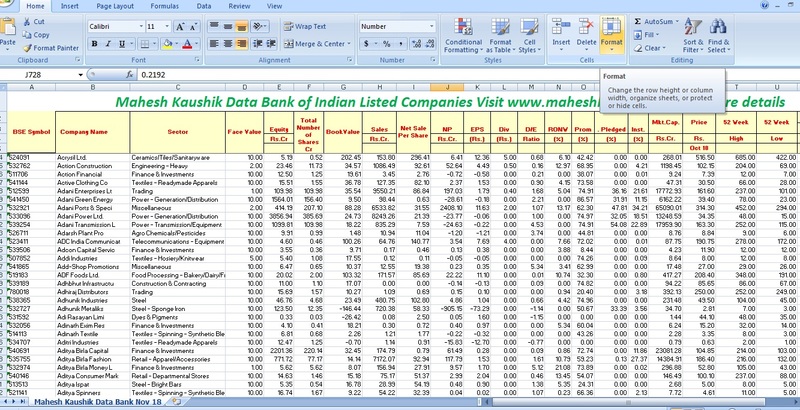 In this databank, you can download all the data in the Excel Sheet. 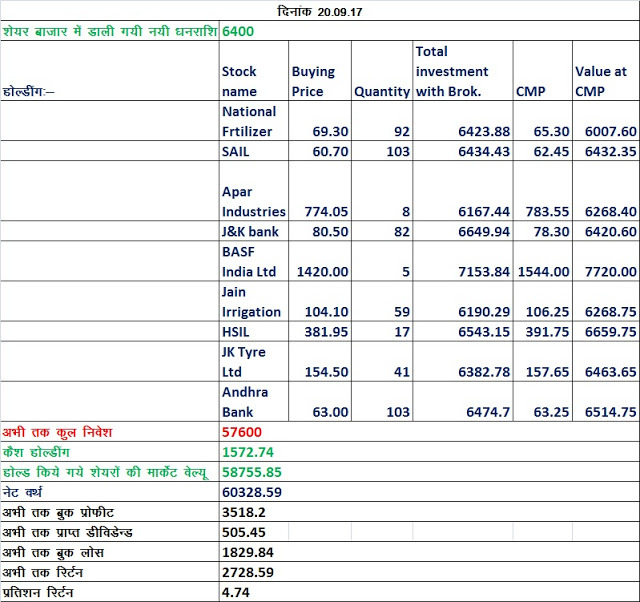 You can find EPS, PE, Net Sale Per Share, Book Value, Promoters Holding, 52 Week High/ Low, ROE of Indian stocks in this Excel Sheet. 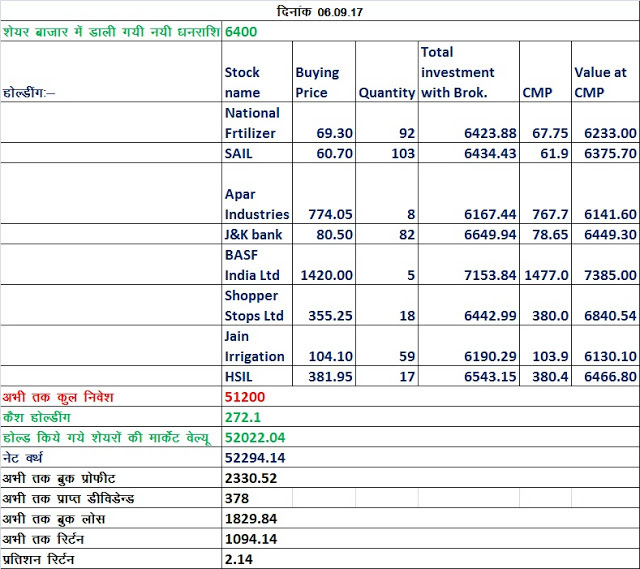 From the help of this databank and my research rules, you can find any good stocks for investment in my research style. 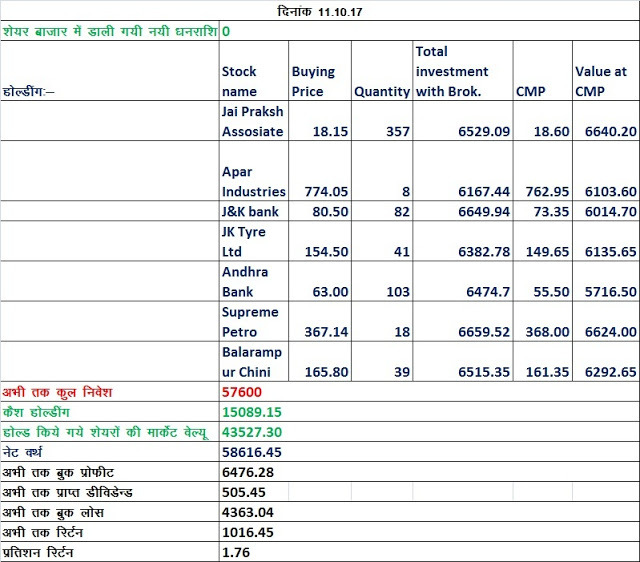 So Simply Download this Excel Sheet and Read my Research Rule and find your stock for investment. However, I want my follower will be self-depended. 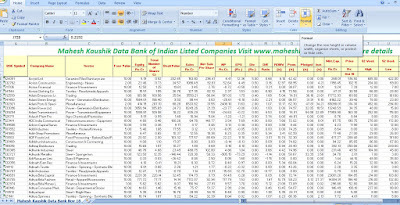 Do not worry after publishing this data bank my next step is updated my blog with fresh recommendations. Thank you for your love and faith. In this part of the blog, we will see what happened between 17th August 2017 to 23rd August 2017. 2. After going home from Tahsil, I check 20-30 shares per day so that I can find new shares, Sometimes I am fatigued and can't-do it. 4. I also work to update my data bank. 5. I also try to read the e-mails and answer to blog and YouTube comments. 6. I am an avid reader as well. I keep looking for new books to read. I have finished a new book "Jivatma Jagat ke niyam" in Hindi. It is a good read where souls are explaining what happens after death. 7. I watch "Tenalirama," " Tarak Mehta ka Ulta Chashma," and "Sajjan Re, Jhooth mat Bolo" in the evening, Even while watching TV, I am busy on my laptop for researching new share and replying to comments. 8. I also help seema in her Seema’s Rasoi blog in the uploading of his videos etc. In this section, you will be told the story from August 24 to August 30. Actually, we have scheduled to buy stock on every Wednesday. 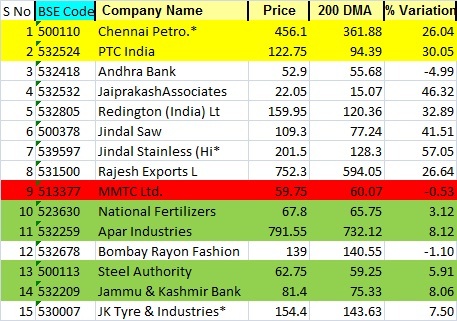 This week, on August 24, 2017, our portfolio had shares of Chennai petroleum which we had purchased on 28th June 2017 at a price of 349, and we were making a profit of 20% on it which is Rs. 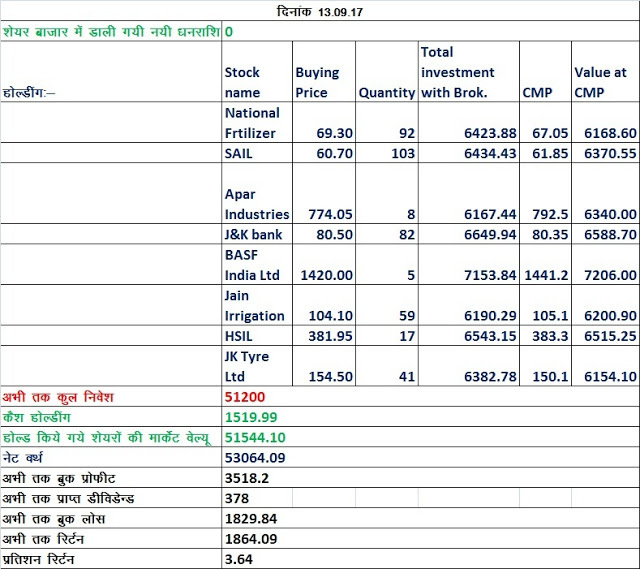 69.80 profit and in that case, we had to sell our shares at 418.80, but on 25th August the market price was 419.15 so Seema sold 18 shares and made a net profit of 1157.07 after brokerage and other charges. If you have gone through previous week's stories, you would be aware of the dividend of 378 which Seema got on these shares. 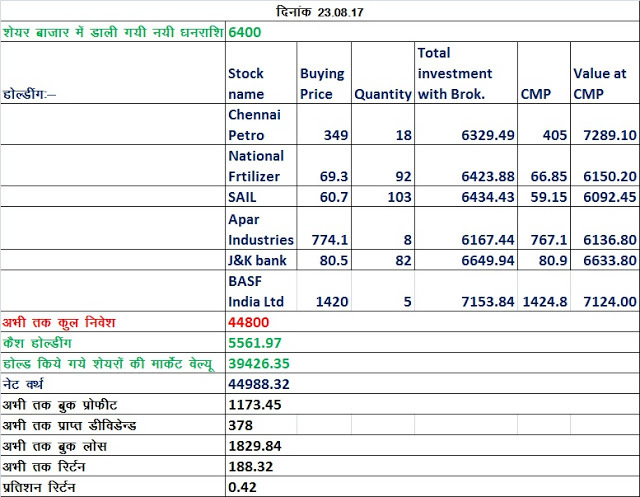 This week, after selling the shares of Chennai Petro, we got Rs 7486.56 after reducing brokerage and tax, so there was no need to invest any new funds to buy shares this week. 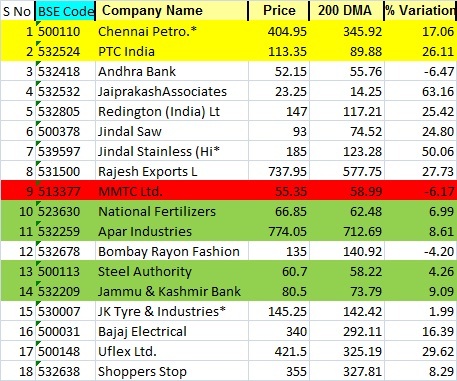 Some readers may say that Chennai Petro rose more than 419 after we sold it. I would say don't regret it as we have fixed a 20% profit cap and after getting it, we invested the amount in Shopper's Stop Ltd. which also increased. In this section, you will be told the story from August 31 to September 6th. Actually, we have scheduled to buy stock on every Wednesday. 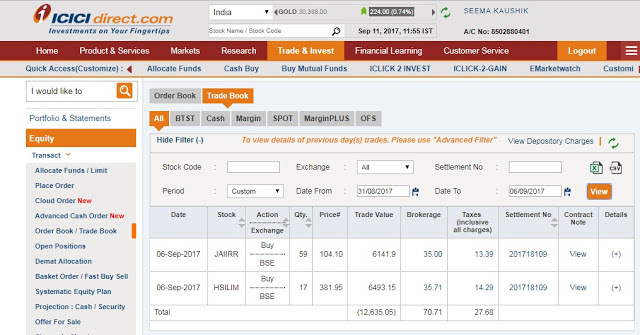 On September 5 this week, the stock of Jain Irrigation closed at 104.10, which closed above 5% of its 200 DMA 97.27.You remember, Seema Kaushik bought 59 shares of Jain Irrigation at the price of 108.10 on July 23, 2017. 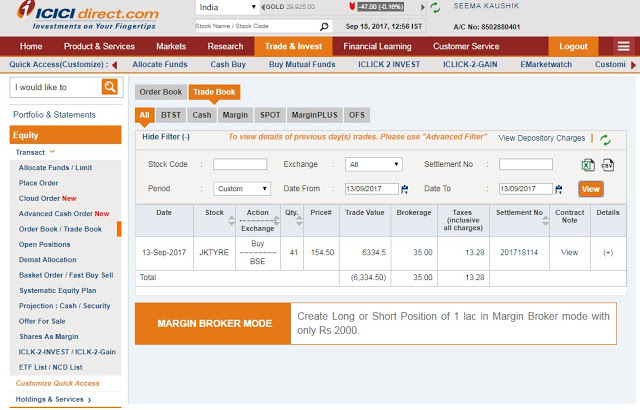 But unfortunately, the stock of Jain Irrigation closed on August 10, 2017, below 5 percent of its 200 DMA, so Seema Kaushik had sold her 59 shares at 91.95 and booked a loss of Rs 1048.37, but it was actually loss booking but trading with the reverse trading system. I have explained it in detail in the 8th week. Read it again to refresh. This does not mean that we will not buy new shares this week. 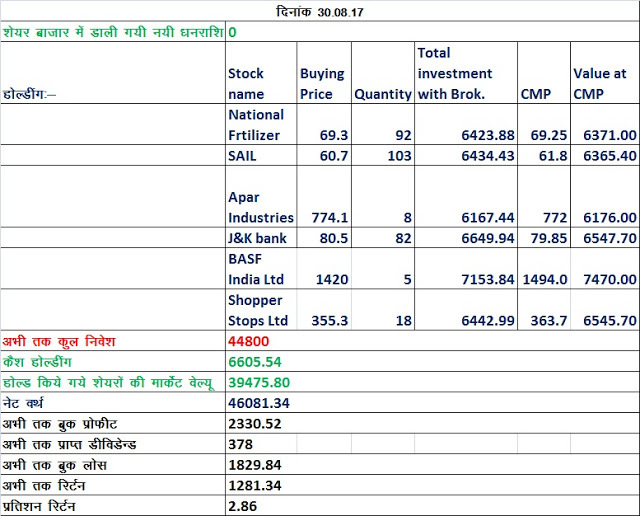 Buying shares of Jain Irrigation are not same as buying new shares. In a way, we had held in indirectly in our portfolio. Selling in reverse trading, i.e., holding indirectly. If you did not understand clearly, then I will narrate a story. Similarly, Jain Irrigation was like a lazy dog to us, but we see it is again turning out to be a hunter again, so we take it back. What should be our target now? Earlier, we had taken 59 shares of Jain Irrigation with the price of 108.10, then our target would be to sell them at 20% above the price, ie, 129.72, but what will be our target now, will this new purchase price be 104.10 to 20% above? Because what will be the meaning of Reverse trading system, the loss we booked has to be added to the target, i.e. 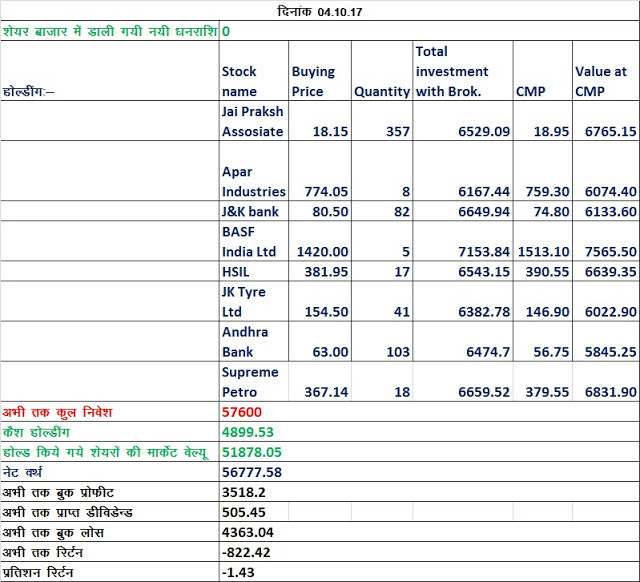 1048.37 will be divided by 59 and thus the loss of 17.77 booked per share will have to be added to the target. 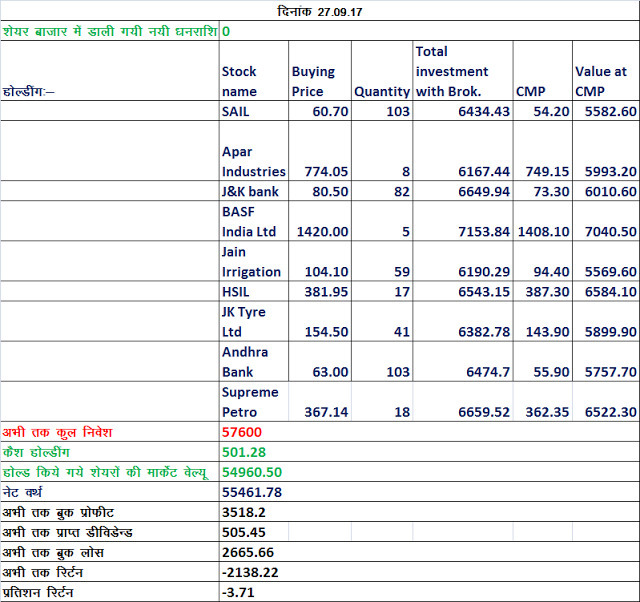 Now, we sell 59 shares of Jain Irrigation from 104.10 to 20% above the price of Rs. 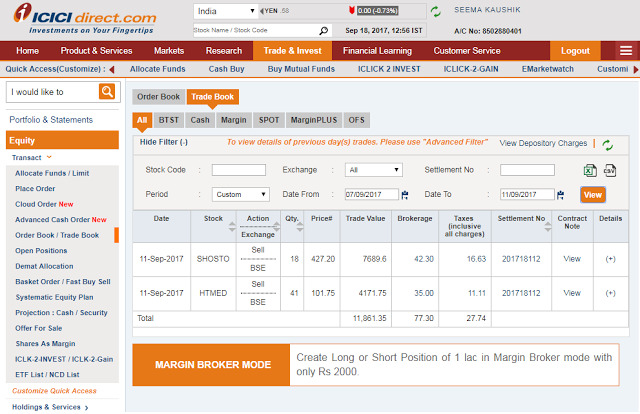 124.92 and 17.77 for 142.69 per share, we will get 20 percent profit from this trade and will cover up the loss of 1048.37 for the reverse trading system.So the reverse trading system has made it 142.69 per share by increasing our previous target of129.72 by 13 Rupees. My regular followers here use my App and they may have it in mind that I had recommended HT Media shares priced at 82, and I am also following my own recommendations, so my wife and I both invest in those shares which we recommend to you. Therefore, my wife also bought HT Media shares and earned profits with Shoppers Stop. When my stated shares are recommended for one year or three to six months and they do not gain for two months then I get comments like this; Have a look! Comment: - Sir, this time you’re told shares did not gain as fast as they used to run before, you have looted me sir. My reply to that comment: - I have not fled (run away) from the share market and am pretty much alive, neither have I looted you. Why do you invest huge capital for short duration, also why don’t you use reverse trading system. And also, my recommendation hasn’t failed and I am holding all the shares recommended by me. For the followers who have little patience and are in habit of investing larger capital amount, I have suggested Reverse Trading; Also I don't even put Stop loss. Regarding the Books, It’s the publishers selling the book and I earn some royalty from that, I am not writing books to earn royalty but to help small investors and to educate them. Keep patience, everything will be okay. And you can see, HT media shares everything turned out to be good. 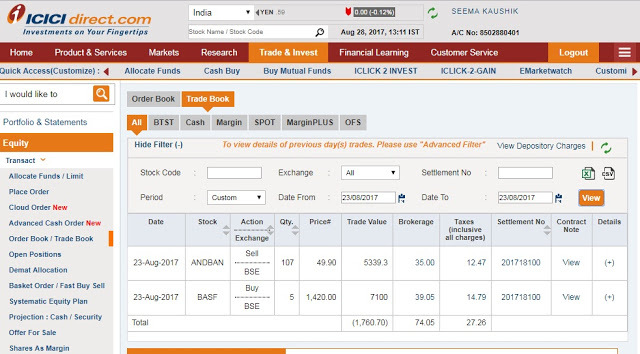 Yellow colored shares indicate that Profit has been booked and after July 2018, in the new edition of the book it will be analysed if they make in the ranking list. Green ones are on Hold with us. Red ones are under reverse trading system and hypothetically they are on a hold. Whenever they will close on 5 % above 200 DMA, we will buy them back. Your comments increase my enthusiasm and negative comments will improve me, so irrespective of wether I reply or not, there should be no laxity in commenting from your end.